Ayurveda states that the loss of hair is basically dependent on the type of the body structure and tri dosha balance. Also, lack of proper circulation of blood in the scalp is yet another important factor for baldness. Improper diet, unhygienic lifestyle, exposure to certain drugs, radiations and therapies are some of the basic contributory factors of Baldness. 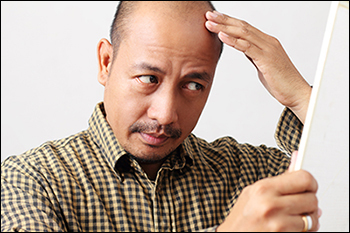 Also, the male hormone, dihydrotesterone deteriorates the hair follicles, which leads to the thinning of hair and eventually, leads to loss of hair and baldness. Too much oiliness of the scalp and excessive stress also result in baldness. Another important cause of hair fall is heredity. There are a lot of home remedies available to treat the condition. There are some herbs as well, which are very effective in treating the medical condition effectively. These herbs have a lot of medicinal properties, which provides relief from early hair loss and thinning of hair to a huge extent. Ashwagandha is scientifically known as withania somnifera. The major characteristic of ashwagandha is it helps to reduce stress to a huge extent. It is packed with antioxidants, amino acids and essential minerals, which keep the hair fit and healthy. It also scavenges the free radical formation and protects the body from dryness, damages, wear and tear effectively. The scientific name of Bhumiamla is Phylanthus Niruri. This herb has anti-oxidating analgesic and anti-inflammatory characteristics. It has pacifying action on pitta and kapha. It also stimulates the functioning of liver and enhances the digestive fire significantly. It contains alkaloids, lignins and bio flavonoids. It has the power to clear the aggravated form of the tridoshas of the body. It is commonly known as licorice is scientifically called Glycyrrhiza glabra. Its preventive and curative properties make it highly beneficial for the treatment of the unnecessary and premature hair fall. It helps to enhance the stamina and level of physical endurance. It is antiallergic, antimutagenic and expectorant in nature. It prevents hair thinning and hair fall considerably. Brahmi, known as Bacopa monnieri is known for its tremendous medicinal properties. This important Ayurvedic herb acts as a tonic to nervous breakdown and other complications. It is also used to treat various skin complications and other disorders effectively. It is also used to treat chronic cough, bronchitis, arthritis, hoarseness, asthma and others to a huge extent. It is a great solution to the medical situation of baldness. Bhrimgraj or Eclipta alba is yet another popular herb for treating alopecia. It pacifies vitiated pitta, kapha and vata. It finds a huge application in the hair fall treatment and hair loss by the medical science. It acts as a cooling agent and a natural conditioner for hair. It helps to maintain the health and fitness of hair as well. Amalaki or Phyllanthus emblica helps to get rid of respiratory tract infections, chronic cough, chest congestion, hair fall and hair loss. This herb prevents the formation of free radical in the body and therefore, prevents the various physiological complications. It contains alkaloids, tannins, Vitamin C and a lot of enzymes. It is adaptogenic in nature and has immune boosting properties as well. 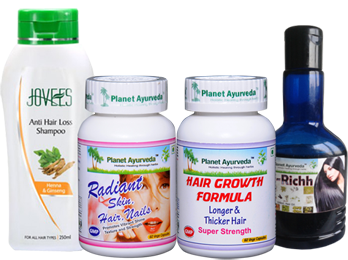 These herbal remedies help to fight away the complication of hair loss easily and quite effectively. Have them for couple of days to months for better results. As they are pure natural there are no worries about side effects and one can take them freely! For more information, check – www.planetayurveda.com and www.alwaysayurveda.com.